By Timothy McKnight, D.O.,and Ankit Patel, D.O. Gallbladder masses are commonly encountered on diagnostic imaging examinations. Distinguishing between benign and malignant conditions is critical, in terms of clinical significance, management, and follow- up. It is important to be familiar with the differential diagnoses of gallbladder masses, recognize imaging features that are diagnostic for each condition, and understand the utility and limitations of each of the cross-sectional imaging modalities currently available. Gallbladder pathology is a frequent source of patient complaint, to include acute or chronic right upper quadrant pain, jaundice, or dyspepsia. As such, the gallbladder is a routinely imaged structure either directly to exclude or characterize gallbladder pathology or in general abdominal imaging for nonspecific complaints or imaging related to adjacent structures. Gallbladder masses as part of the spectrum of gallbladder pathology are commonly encountered at imaging. It is important for the diagnostic imager to be familiar with the broad differential of gallbladder masses. While most gallbladder masses are benign and do not present a diagnostic dilemma, they may present with unusual or nonspecific imaging appearances, or on a modality that is not typically used to characterize gallbladder pathology. 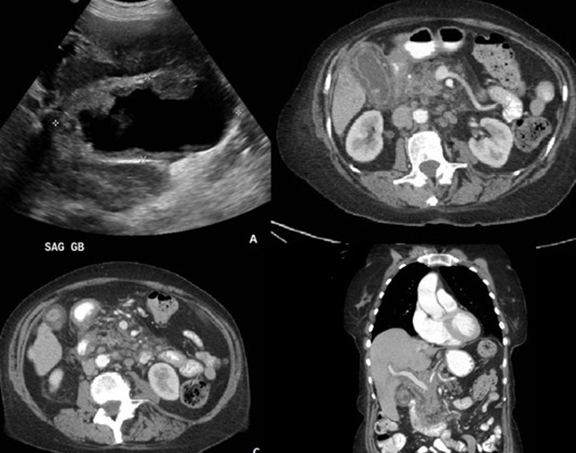 The purpose of this article is to review the spectrum of gallbladder masses (Table 1) and mass-like lesions on US, CT, and MR, providing the reader with the ability to recognize benign disease, identify worrisome imaging features, and review the diagnostic information each cross-sectional modality may provide. Cholelithiasis, or gallstones, represents the most commonly encountered gallbladder mass. They affect over 25 million individuals or about 10% of the U.S. adult population, affecting women more than men by a ratio of 2:1; the risk increases with age.1 Consequently, they typically are not a diagnostic challenge but remain important to recognize on all modalities, so as not to be confused with more ominous lesions. Common associations include diabetes, oral contraceptives, estrogen replacement, obesity, ileal disease, total parenteral nutrition, cirrhosis, and certain medications.2 Gallstones are present in up to 95% of cases of acute cholecystitis, 65% of adenomas, 95% of porcelain gallbladders, and 90% of gallbladder adenocarcinomas.3,4,5 Eighty percent of stones are cholesterol stones (contain greater than 50% cholesterol; 10% being pure cholesterol), and the remaining 15-20% are pigmented stones (contain <25% cholesterol), which are primarily composed of calcium bilirubinate and glycoproteins. Ultrasound is the most common modality employed for initial evaluation of the gallbladder. Sonography is highly sensitive and specific for cholelithiasis, detecting >95% for stones over 2mm. 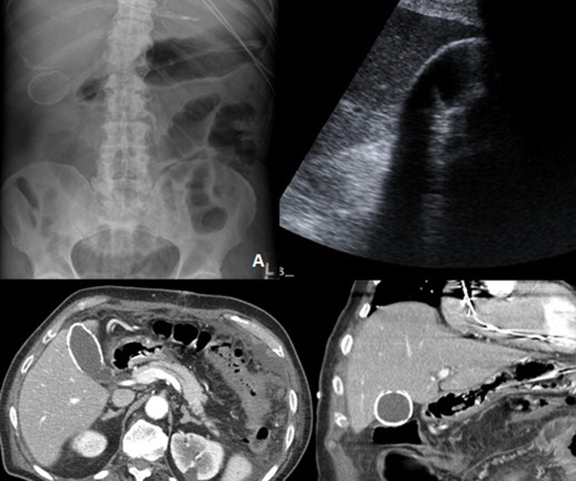 Gallstones are classically mobile and strongly echogenic with marked posterior acoustic shadowing.6 Demonstrating the posterior acoustic shadowing is variable and dependent upon technique when imaging the patient. Occasionally numerous or very large stones can fill the gallbladder, resulting in a wall-echo-shadow complex (WES). The anterior wall of the gallbladder is echogenic, followed by a thin hypoechoic line of intraluminal bile, then an echogenic line representing the superficial margin of the stone. Posterior shadowing obscures the deeper stones (Fig. 1).4,7 The WES complex is specific to gallstones and is important in diagnosing benign stone disease versus a soft tissue mass filling the gallbladder lumen. MR detection of gallstones is best appreciated on T2-weighted images, especially magnetic resonance cholangiopancreatography (MRCP) sequences. Overall MR sensitivity is approximately 90-95%. Gallstones are typically hypointense on T1 and T2 weighted images. Less common appearances include a T1 or T2 hyperintense central focus surrounding by low signal or a predominantly T1 hyperintense appearance. The imaging appearance has been attributed to the relative amount of protein or pigment; pure cholesterol stones are typically uniformly low in T2 and T1 signal, and highly pigmented stones are predominantly hyperintense in T1 signal.5 This can be an important feature for deciding management of impacted stones, as the pigment stones are softer and may be easier to treat endoscopically; pure cholesterol stones are more solid, making endoscopic treatment more difficult. Another commonly encountered mass is the gallbladder polyp. Incidence of gallbladder polypoid lesions has been reported in 3 - 5% of the adult population.12 Gallbladder polyps represent a spectrum of processes presenting with similar morphology and appearance at imaging. Most of these are benign, including cholesterol polyps and benign adenomas which are discussed here; malignant lesions are discussed separately. Both cholesterol and adenomatous polyps appear sonographically as non-mobile, echogenic, non- shadowing masses. They may be sessile or pedunculated, have a stalk which may or may not be visible, and may show internal vascularity (Fig. 3). Adenomas and cholesterol polyps are usually smooth but may also be lobular or cauliflower-like. One important feature is that the gallbladder wall adjacent to a benign polyp should be normal; any irregularity or focal thickening >3mm should raise the suspicion for malignancy. Adenomyomatosis, also known as adenomyomatous hyperplasia or diverticular disease of the gallbladder, represents one of two acquired benign hyperplastic cholecystoses. It is found in approximately 1-8% of cholecystectomy specimens.25,26 The pathologic hallmark of adenomyomatosis is intraluminal cholesterol deposition that becomes trapped within dilated Rokitansky-Aschoff sinuses, along with bile salts, sludge, and calculi. There is associated wall thickening from hyperplasia of both the mucosa and muscularis propria.25 Cholecystosis is the second benign hyperplastic cholecystosis process, and represents cholesterol and triglyceride deposition in the lamina propria. This results in the classically described “strawberry gallbladder” appearance. Biliary sludge represents highly viscous bile with high bilirubin content. It is usually the result of biliary stasis from prolonged fasting or hyperalimentation. Tumefactive sludge is typically associated with cholelithiasis, and evolution of tumefactive sludge to calcium bilirubinate stones has been described.30 Tumefactive sludge is most commonly encountered as an incidental finding on ultrasound evaluation for right upper quadrant pain. Additional rare entities that the radiologist should have a passing familiarity with are listed in (Table 1). A detailed discussion of most of these entities is beyond the scope of this article and is well described in a review by Levy et al.3 Of these entities, xanthogranulomatous cholecystitis (XGC) may be the most important to know. This represents a histiocyte- predominant inflammatory process from bile extravasation into the gallbladder wall through ulcerated Rokitansky-Aschoff sinuses.3,5 It most often presents with clinical symptoms identical to typical cholecystitis. Its imaging appearance mimics that of aggressive invasive carcinoma, as the infection may spread into local adjacent organs. It has also been described as an associated risk factor of primary gallbladder carcinoma.3 Wall thickening is the most common finding but is nonspecific. The typical sonographic appearance has been described as wall thickening with multiple hypoechoic bands or nodules. CT findings suggestive of XGC include a low attenuation nodule involving more than 60% of the thickened gallbladder wall area and a continuous line of mucosal enhancement.3 These same findings are seen on T2 and post-contrast T1 MRI sequences. Intramural T2 hyperintense foci correspond to the low density nodules on CT and represent abscesses and foci of xanthogranulomatous inflammation. The cross-sectional appearance of gallbladder carcinoma for US, CT, and MR is that of a mass replacing the gallbladder (40-65%), focal or diffuse wall thickening (20-30%), or an intraluminal polypoid mass (15-25%) (Figures 5-7).39 Most gallbladder carcinomas present at an advanced stage and are not diagnostically challenging. There is typically local invasion of liver or adjacent organs, which significantly limits therapeutic options. It is important to be aware of the utility of cross sectional imaging in staging and prognosis of gallbladder carcinoma. Sonography is not useful in staging of gallbladder carcinoma; Bach et al. reported that only 37% of patients with advanced disease could be identified on US.40 In another study, Tsuchiya described that 30% of early carcinomas may be missed by ultrasound.41 Endoscopic ultrasound improves success in both characterizing local disease and identifying regional nodal spread versus conventional ultrasound. CT and MR are more useful in staging, as they more accurately define local extent of disease, regional adenopathy, and distant metastases. CT sensitivity for hepatic invasion is 65% if <2cm and 100% if >2cm. Sensitivity for nodal spread has been reported as 36% for N1 and 47% for N2 disease; there is 99% specificity for nodes >10mm.42CT has a reported an overall T stage accuracy of 84% and an accuracy of 85% in determining resectability. MR has a variable reported sensitivity between 67-100% for hepatic invasion, although the depth of invasion is underestimated in approximately 10% of cases. MR sensitivity for lymphadenopathy has been reported between 56- 92%.5,39 MR and CT are also useful in detecting vascular invasion by tumor. Metastases and Other Rare Malignancies. Approximately 98% of gallbladder malignancies represent primary carcinoma.42 The next most common malignancy is metastases. Malignant melanoma is the most common primary tumor to metastasize to the gallbladder, representing just over 50% of reported cases.48 The sonographic appearance of melanoma metastases is one or more hyperechoic mural masses >1cm in diameter. Unfortunately, a study of 464 patients with malignant melanoma by Holloway et al. demonstrated that while 15-20% of patients had gallbladder involvement at autopsy, only 4.1% had detectable disease on ultrasound.49 The CT appearance is that of a polypoid enhancing mass or irregular wall thickening. Most of the lesions are serosal, but they may also be intraluminal. The typical MR appearance is that of a T1 and T2 hyperintense mass. The T1 hyperintensity has been attributed to both the melanin content, which can be variable, as well as hemorrhage or necrosis. Because of the pre-contrast T1 hyperintensity, post-contrast imaging may not be helpful. The enhancing gallbladder wall may become isointense with the lesions, decreasing detection.50 Other reported metastases to the gallbladder include renal cell carcinoma and hepatocellular carcinoma. There are numerous causes of gallbladder masses, benign much more common than malignant, which are frequently found on imaging. Familiarity with the diverse etiologies of these masses and their presentations on various cross-sectional imaging modalities is critical. This knowledge provides the radiologist with the ability to make earlier and more confident diagnoses and assist referring clinicians in facilitating appropriate management. At times, costly diagnostic workups and interventions may be avoided. Zeman RK. Cholelithiasis and cholecystitis. In: Gore RM, Levine MS, Laufer I, eds. Textbook of gastrointestinal radiology. Philadelphia, Pa: Saunders, 1994;1636-1674. Strom BL, West SL. The epidemiology of gallstone disease. In: Cohen S, Soloway RD. Gallstones. New York, NY: Churchill Livingstone, 1985;1-26. Levy AD, Murakata LA, Abbott RM et al. Benign Tumors and Tumorlike Lesions of the Gallbladder and Extrahepatic Bile Ducts: Radiologic-Pathologic Correlation. Radiographics 2002; 22:387-413. Bortoff GA, Chen MYM, et al. Gallbladder Stones: Imaging and Intervention. Radiographics 2000; 20:751-766. Catalano OA, Sahani DV, et al. MR Imaging of the Gallbladder A Pictorial Essay. Radiographics 2008; 28:135-155. McIntosh DM, Penney HF. Gray-scale ultrasonography as a screening procedure in the detection of gallbladder disease. Radiology 1980;136. Grand D, Horton KM, Fishman, EK. CT of the Gallbladder: Spectrum of Disease. AJR 2004; 183:163-170. Chan WC, Joe BN, et al. 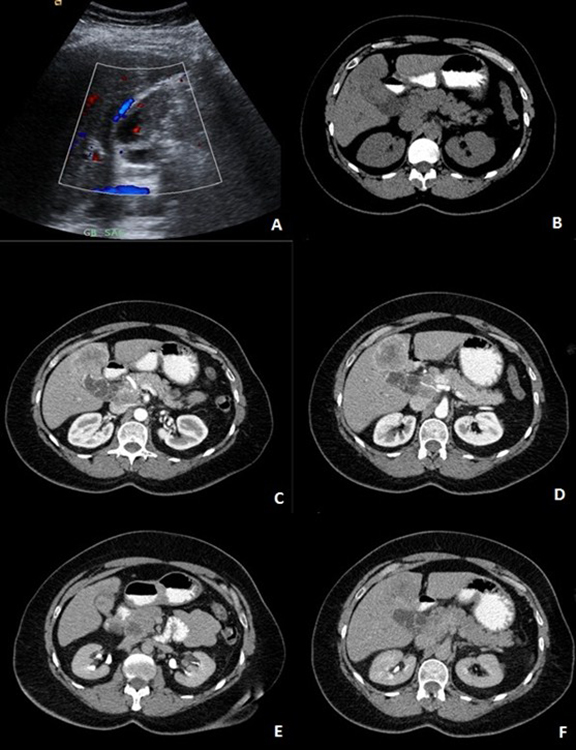 Gallstone Detection at CT in Vitro: Effect of Peak Voltage Setting. Radiology 2006,241:546-553. Meyers MA, O’Donohue N. The Mercedes-Benz Sign: Insight into the Dynamic of Formation and Disappearance of Gallstones AJR 1973;119:63-70. Delabrousse E, Bartholomot B et al. Gas-containing gallstones: value of the “Mercedes-Benz”sign at CT examination. J Radiol 2000;81:1639-1641. Ishikawa O, Ohhigashi H, Imaoka S, et al. The difference in malignancy between pedunculated and sessile polypoid lesions of the gallbladder. Am J Gastroenterol 1989;84:1386-1390. Albores-Saavedra J, Vardaman CJ, Vuitch F. Nonneoplastic polypoid lesions and adenomas of the gallbladder. Pathol Annu 1993;28(pt1):145-177. Misra S, Chaturvedi A, Misra NC, Sharma ID. Carcinoma of the gallbladder. Lancet Oncol. 2003;4:167-176. Wada K, Tanaka M, Yamaguchi K. Carcinoma and polyps of the gallbladder associated with Peutz-Jeghers syndrome. Dig Dis Sci 1987;32:943-946. Walsh N, Qizilbash A, Banerjee R, Waugh GA. Biliary neoplasia in Gardner’s syndrome. Arch Pathol Lab Med 1987;111:76-77. Wistuba II, Miquel JF , Gazdar AF , Albores- Saavedra J . Gallbladder adenomas have molecular abnormalities different from those present in gallbladder carcinomas. Hum Pathol 1999;30(1):21-25. Roa I , de Aretxabala X , Araya JC , Villaseca M , Roa J , Guzmán P . Incipient gallbladder carcinoma: clinical and pathological study and prognosis in 196 cases. Rev Med Chil 2001;129(10):1113-1120. 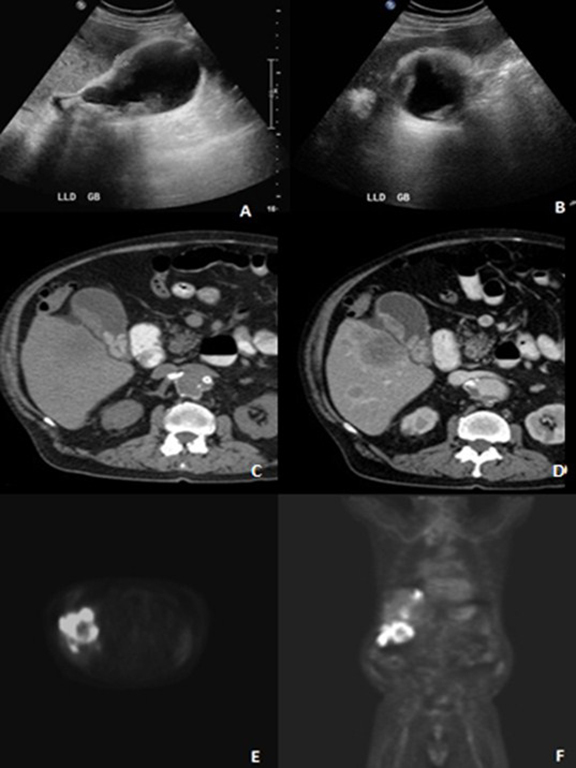 Hiroyoshi F, Tomoo K. Small Polypoid Lesions of the Gallbladder: Differential Diagnosis and Surgical Indications by Helical Computed Tomography. Arch Surg. 1998; 133:735-739. Yoshimitsu K, Honda H, Dynamic MRI of the gallbladder lesions: differentiation of benign from malignant. J Magn Reson Imaging. 1997 Jul-Aug;7(4):696-701. Irie H, Kamochi N. High b-value diffusion-weighted MRI in differentiation between benign and malignant polypoid gallbladder lesions. Acta Radiol. 2011 Apr 1; 52(3):236-40. Epub 2011 Mar 3. Tseng JH, Wan YL, Hung CF, et al. Diagnosis and staging of gallbladder carcinoma: evaluation with dynamic MR imaging. Clin Imaging 2002;26:177-182. Park JK, Yoon YB Management Strategies for Gallbladder Polyps: Is It Possible to Predict Malignant Gallbladder Polyps? Gut Liver. 2008 September; 2(2):88-94. Corwin MT, Siewert B, et al. Incidentally Detected Gallbladder Polyps: Is Follow-up Necessary? - Long-term Clinical and US Analysis of 346 Patients. Radiology 2011; 258:277-282. Boscak AR, Al-Hawary M, et al. Best Cases of AFIP: Adenomyomatosis of the Gallbladder. Radiographics 2006; 26:941-946. Ching BH, Yeh BM, et al. CT Differentiation of Adenomyomatosis and Gallbladder Cancer. AJR 2007; 189:62-66. Yamamoto A, Ozeki Y, et al. 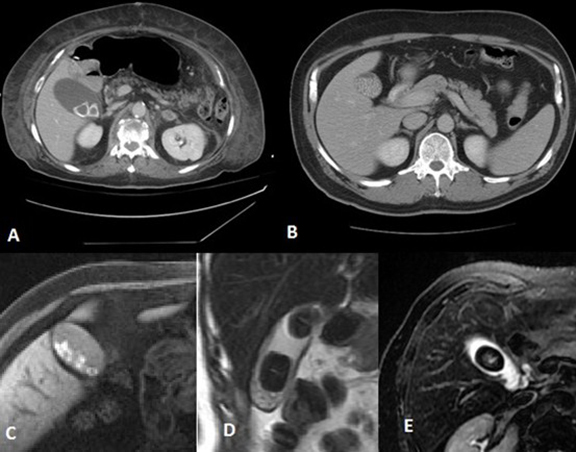 Successful Diagnosis of Gallbladder Carcinoma Coexisting with Adenomyomatosis by (18)F-FDG-PET- Report of a Case. J Gastrointest Cancer. 2011 Dec; 42(2):252-6. Haradome H, Ichikawa T, et al. The Pearl Necklace Sign: An Imaging Sign of Adenomyomatosis of the Gallbladder at MR Cholangiopancreatography. Radiology 2003; 227:80-88. Yoshimitsu K, Honda H, et al. MR Diagnosis of Adenomyomatosis of the Gallbladder and Differentiation from Gallbladder Carcinoma. Importance of Showing Rokitansky- Aschoff Sinuses. AJR 1999; 172: 1535-1540. Rosenthal SJ, Cox GG, et al. Pitfalls and Differential Diagnosis in Biliary Sonography. Radiographics 1990; 10:285-311. 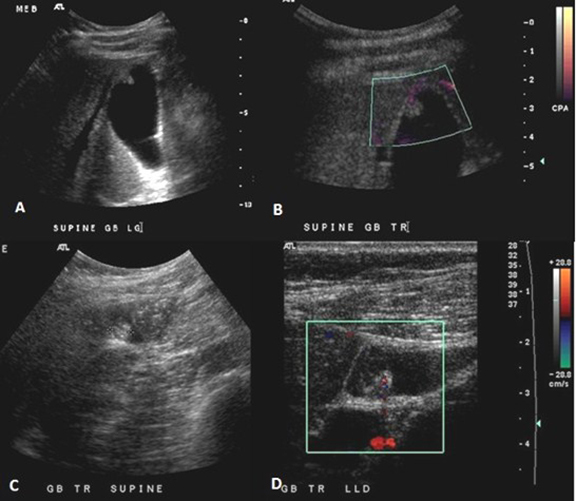 Fakhry J. Sonography of Tumefactive Biliary Sludge. AJR 1982; 139:717-719. Hanbidge AE, Buckler PM, et al. From the RSNA Refresher Courses: Imaging Evaluation for Acute Pain in the Right Upper Quadrant. Radiographics 2004; 24: 1117-1135. Rebner M, Ruggieri PM, et al. CT Evaluation of Intracholecystic Bile. AJR 1985; 145(2): 237-240. Newatia A, Khatri G, et al. Subtraction Imaging: Applications for Nonvascular Abdominal MRI. AJR 2007; 188(4):1018-1025. Greenlee RT, Murray T, Bolden S, Wingo PA. Cancer statistics 2000. CA Cancer J Clin 2000; 50:7-33. Henson DE, Albores-Saavedra J, Corle D. Carcinoma of the gallbladder: histologic types, stage of disease, grade, and survival rates. Cancer 1992; 70:1493-1497. Strom BL, Soloway MD, Rios-Dalenz JL, et al. Risk factors for gallbladder cancer: an international collaborative case-control study. Cancer 1995; 76:1747-1756. Albores-Saavedra J, Henson DE, Sobin LH. 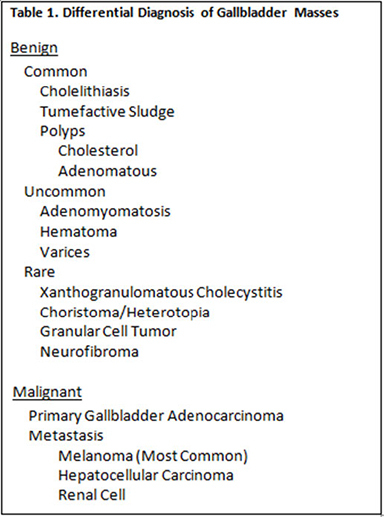 WHO histological typing of tumors of the gallbladder and extrahepatic bile ducts. Berlin, Germany: Springer-Verlag, 1991. Furlan A, Ferris JV, Gallbladder Carcinoma Update: Multimodality Imaging Evaluation, Staging and Treatment Options. Radiographics 2008; 191:1440-1447. Bach AM, Loring LA, Hann LE, Illescas FF, Fong Y, Blumgart LH. 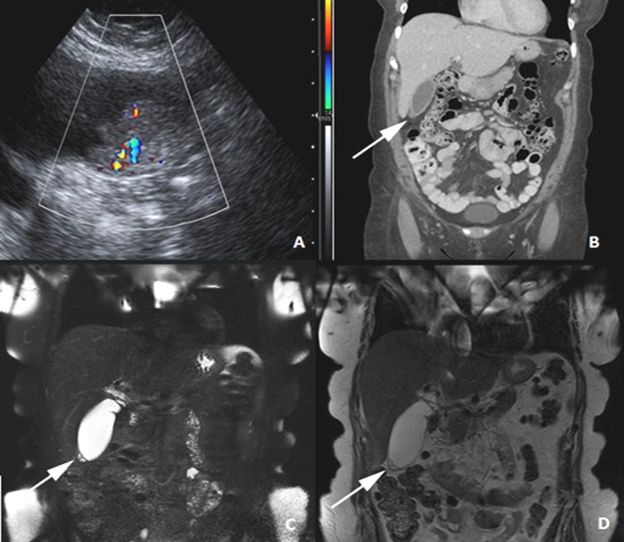 Gallbladder cancer: can ultrasonography evaluate extent of disease? J Ultrasound Med 1998; 17:303-309. Tsuchiya Y. Early carcinoma of the gallbladder: macroscopic features and US findings. Radiology 1991; 179:171-175. Levy AD, Murakata LA, et al. Gallbladder Carcinoma: Radiologic-Pathologic Correlation. Radiographics 2001; 21:295-314. Weiner SN, Koenigsberg M, et al. Sonography and computed tomography in the diagnosis of carcinoma of the gallbladder. AJR 1984; 142:735-739. Kahn ZS, Livingstone EH, et al. Reassessing the Need for Prophylactic Surgery in Patients with Porcelain Gallbladder. Arch Surg. 2011; 146(10):1143-1147. Rodriguez-Fernandez A, Gomez-Rio M. Positron-emission tomography with fluorine-18-fluoro-2-deoxy-D-glucose for gallbladder cancer diagnosis. Am J Surg. 2004 Aug; 188(2):171-5. Koh T, Tanigichi H, Yamaguchi A, Kunishima S. Differential diagnosis of gallbladder cancer using positron emission tomography with fluorine-18-labeled fluoro-deoxyglucose (FDG PET). J Surg Oncol 2003;84:74-81. Maldjian PD, Ghesani N, Ahmed S, Liu Y. Adenomyomatosis of the Gallbladder: Another Cause of a “Hot” Gallbladder. AJR 2007; 189: W36-W38. Kim MJ, Kim KW, Kim HC, et al. Unusual Malignant Tumors of the Gallbladder. AJR 2006; 187:473-480. Holloway BJ, King DM. Ultrasound diagnosis of Metastatic Melanoma of the Gallbladder. BJR 1997;70:1122-1125. Martel JP, McLean CA, Rankin RN. Best Cases of AFIP: Melanoma of the Gallbladder. Radiographics 2009;29-291-296. McKnight T, Patel A. Gallbladder Masses: Multimodality Approach to Differential Diagnosis. J Am Osteopath Coll Radiol. 2012;1(4):22-31. Timothy McKnight, D.O.,and Ankit Patel, D.O. University of California Irvine Medical Center, Department of Radiology, Irvine, CA.